Washington, fearing the loss of its economic and technological leadership, sees these companies as a threat. Translated from French by Maren Daniel. Edited by Nkem Okafor. Uncle Sam cites national security concerns as one reason for its revolt against Huawei and ZTE, but it also sees these manufacturers as a very serious threat to its economic interests. Huawei is in the eye of the storm since the arrest of Meng Wanzhou in Canada at America’s request. Meng is the group’s financial director and the daughter of its founder. The U.S. Justice Department suspects that the director of the Chinese giant of telecommunications equipment and smartphones has violated American sanctions toward Iran, which Huawei denies. In any case, the arrest, which has recently dampened relations between Beijing and Washington, is just the latest in the very, very long list of Huawei’s setbacks in Uncle Sam’s country. These last few years, Huawei has been thrown out of a number of overseas markets. It has been indiscriminately excluded from a submarine cable project and from the telecommunications equipment market. AT&T, a potentially major partner, also recently dropped Huawei’s smartphone. This slew of setbacks convinced the Chinese telecom champion to pull out of the United States altogether last spring. These past few months, ZTE, China’s other powerhouse of telecommunications equipment, has caught a lot of heat from Uncle Sam as well. Due to substantial American sanctions for having done business with Iran and North Korea, the manufacturer even had to stop its activities for a time. Aside from judicial attacks regarding the violation of embargos, the United States regularly puts a spoke in Huawei and ZTE’s wheels, citing national security concerns. Washington and a segment of the American political class fear that these jewels of China’s empire will use their equipment to spy on Beijing’s behalf. But another motive, despite its importance, gets less attention – the defense of American economic interests. Yet, in the eyes of many observers, this is the first explanation for American attacks on Chinese telecom and tech companies. Last spring, in the columns of The Financial Times, Richard Staropoli, former chief information officer at the U.S. Department of Homeland Security, signed an opinion column that reveals a lot about Washington’s strategy toward Beijing. At the time of its publication on April 2, the United States and China were starting to fan the flames of a trade war by imposing tariffs on their respective products. Staropoli confirmed at the time that the United States’ “next tariffs will explicitly target Chinese technology.” Current events and the American revolt against Huawei and ZTE seem to have given him reason. Staropoli explained in his commentary that by targeting these businesses, Uncle Sam wanted to bring down the “Made in China 2025” program, “which the U.S. sees as a direct threat to American economic hegemony.” That is because the United States knows this program’s aim is to make China a world leader in technological innovation. One of the pillars of China’s strategy rests on the development of future 5G mobile networks. The way Beijing sees it, this communication technology, which will allow for the connection of all the objects around us, constitutes the essential breeding ground for tomorrow’s internet giants. That is why Huawei and ZTE, who have become true world leaders in this domain, are so key in Beijing’s eyes. In contrast, that is also why Washington, fearing the loss of its economic and technological leadership, sees these companies as a threat. In his column, Staropoli affirmed that the Trump administration would do everything in its power to slow China’s efforts in 5G. The White House has put strategies in place in order to “disrupt China’s government-subsidized rise in the wireless world,” he explained. One can wonder, when looking through this prism, if the United States has not deliberately decided to harm Huawei and ZTE by all means necessary in order to preserve its own economic interests. The security concerns that Huawei and ZTE pose may very well be real and are certainly taken seriously by a growing number of countries – countries who are sometimes quick to banish them – but the fact remains that efforts deployed by the United States to stop the rise of these groups call out to us and give us reason for pause. 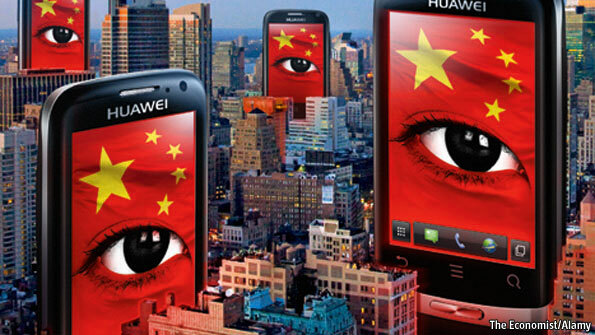 Moreover, last month, according to The Wall Street Journal, Washington launched a lobbying campaign to convince its allies (namely Germany, Italy and Japan) to give Huawei’s devices the cold shoulder, arguing that they constitute a threat for the security of communications.